Before you complain, no I did not eat any mushy peas. Yes, they are the most famous foodstuff of the Goosefair but I don’t like them. That might have something to do with the fact that my dad has insisted on serving them on Christmas day over the last few years….regardless, leave me in peas. There is lots of choice though, yes you get plenty of cheap hot dogs and burger vans but nowadays much more. Having enjoyed a craft beer at the bar we headed toward the food, most of the food stands are in the corner of Noel Street and Forest Road East. 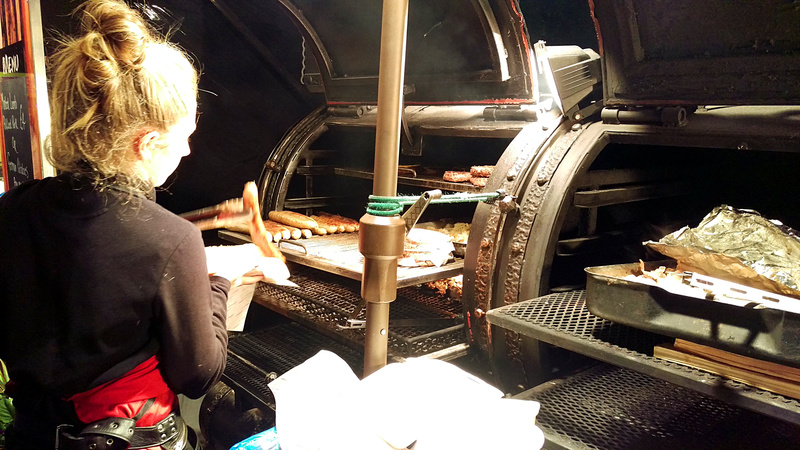 In the classic fair food vein, but looking a bit posher, was a cast iron smoker filled with meat. An oversized hot dog was requested for the princely sum of £4 and dispensed with a nod to a dark corner where you applied your own sauce. Even with plenty of mustard it failed to excite us, not enough onions and smoky flavour not as prominent as expected. Onwards and upwards (happily not onto any rides that turned me upside down) and we happened upon a selection of Chinese dishes. 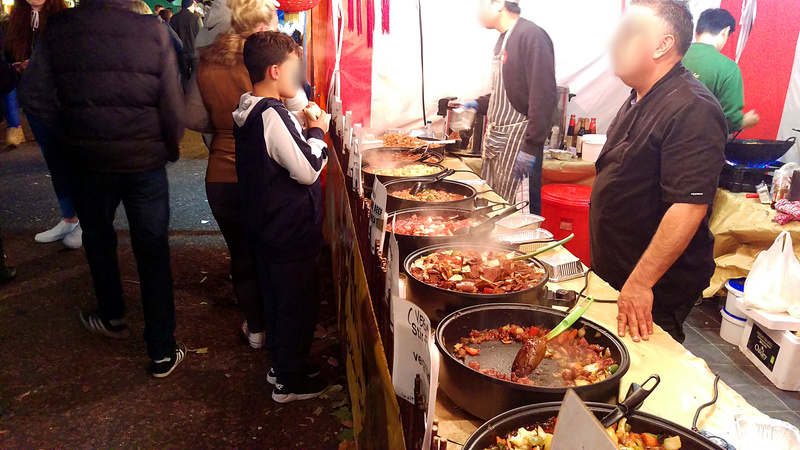 Had I of seen that one of their options was sweet and sour doner kebab (seriously) then I would probably have kept walking. A combo of Kung Pao chicken and some noodles seemed a popular choice judging by the almost empty bowls at the stand. It wasn’t bad, slightly small portion for £6 but good soy flavour coming from the noodles against the sweet Kung Po. Some spice would have been welcome. 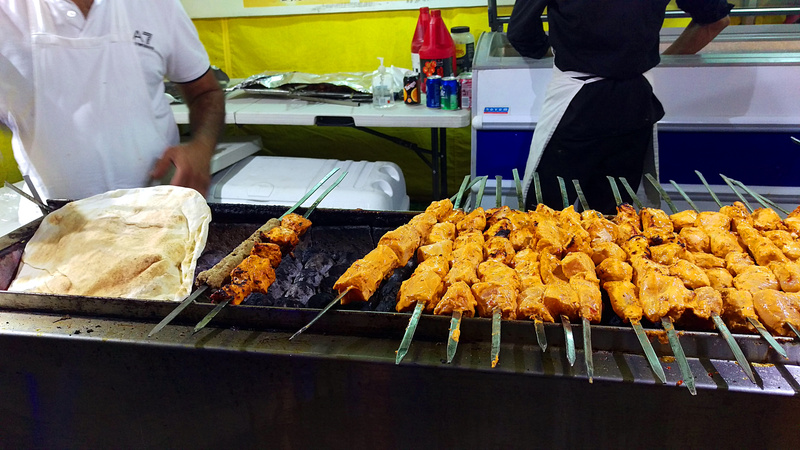 The best of the food was probably the classic kebab. Specifically a combination of chicken tikka and lamb sheikh kebab that set me back £6. The meat was cooked freshly over hot coals, a flavour that did come though. The sauces (I just said give me everything) were also great, bringing some heat. The night ended with handfuls and homemade fudge, some rock and nougat. A proper evening at the fair.